I was very happy when I got an email from DP World London Gateway to say that I could come to the site and make some recordings there. 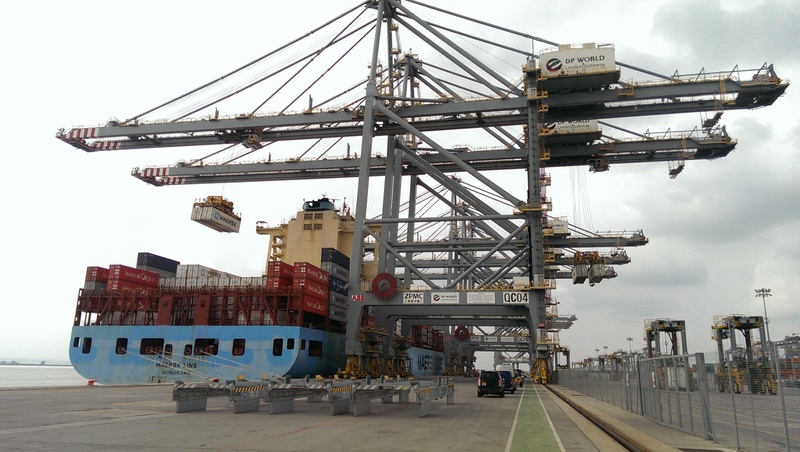 The cranes have been dominating the south Essex skyline for a while now, and after seeing the Felixstowe port cranes and container ships at close quarters on my recent trip to Harwich, I was excited to be visiting the brand new Essex port. Matt Abbott gave me a great tour of the facility and was very informative about all of the vehicles and procedures that enable the port to handle a lot of containers from the increasing amount of huge ships that bring us (almost) everything we buy in the shops. In the recordings you can hear the huge Quay cranes loading up the Maersk Lins container ship (see picture), shuttle carriers bringing the containers to be loaded two at a time, Automatic Stacking Cranes loading and unloading lorries, a Rail Mounted Gantry Crane loading containers on to a freight train and a Terminal Tractor picking up a translifter loaded with a container.